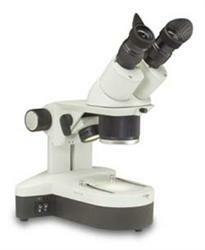 The National Optical 460TBL microscope is a compact stereo zoom microscope at an exceptionally low price. By simply turning the objective turret, magnification can be changed from 10x to 30x, and every point in between. Achromatic optical system provides sharp, parfocalled image throughout the zoom range, without having to refocus. Objective Lenses: 1x - 3x objective - provides continuous zoom magnification. Viewing head rotates 360°. 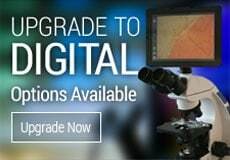 Eyepieces: Choose from paired widefield 10x or 15x eyepieces. 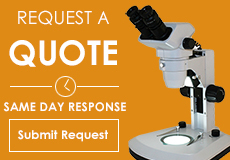 5x or 20x eyepieces can be purchased separately below. Eyetubes are 45° inclined, with left diopter adjustment, interpupillary adjustment from 55mm to 75mm. Accepts 23mm eyepiece reticle (#965-400-05 or #965-400-10). Specimen Stage: Two 80mm stage plates - black plastic contrast and translucent white. Includes blue filter for transmitted light and locked on stage clips. Stand: Heavy-duty all metal frame with fixed arm. Focusing: Large dual focusing knobs with slip clutch to prevent damage to mechanism. Rack and pinion focusing, tension adjustment eliminates focus 'drift'. Illumination: Top light is 12v 10 watt halogen with reflector with directional lever which puts the light where you need it. Bottom light is 110v 5 watt fluorescent for cool operation, greater light efficiency. Top and bottom lights can be used together or separate of each other. Size & Weight: 12.5", 9 lbs. Warranty: Lifetime limited warranty excluding bulb, cord and fuse.